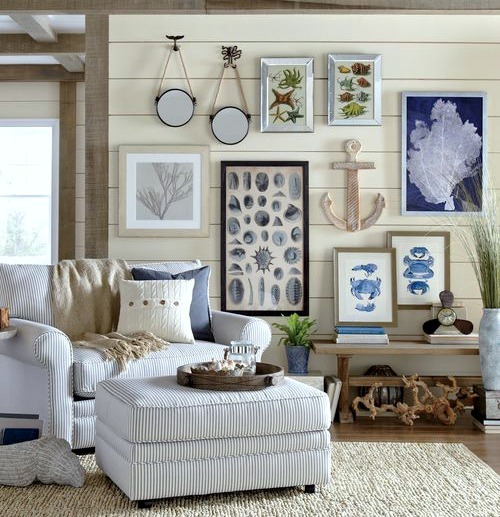 Coastal Decor Inspiration from Birch Lane's catalog rooms. Creative coastal wall decor ideas, living room ideas, and dining room idea. Shop the Look! The gallery wall combines pieces from Birch Lane's Coastal Wall Art Collection, a Wooden Anchor, and Round Rope Mirrors that hang from adorable Sea Life Wall Hooks. Casual and classy coastal living room with a super functional Coffee Table. Accents include Coastal Decor such as a Driftwood Boat and Fishing Weights. And a Starfish Jute Pillow and Sand Dollar Jute Pillow dress up the couch. Note: exact pillows are no longer available. 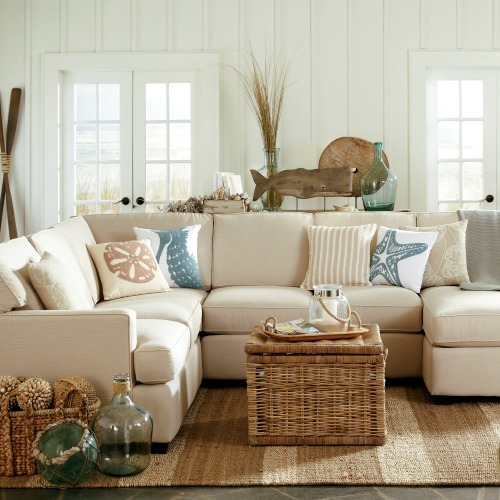 Beachy, nautical and neutral living room idea. The Under the Sea Pillows and Wooden Whale on Stand stands out. Rope Handle Tray with Glass Jar Lantern that's filled with sand create a lovely vignette on the Trunk Coffee Table. Living room with statement shelf. A great Boat Shelf that includes drawer storage. If you're handy, check out this DIY Boat Shelf. Console table with coastal vignette and gallery wall. Coastal ambiance is created around Birch Lane's Console Table. You can find the Blue Sea Life Framed Prints in their Wall Art Collection. Nautical nook with Day Bed. Center stage, a great Rustic Rope Mirror. 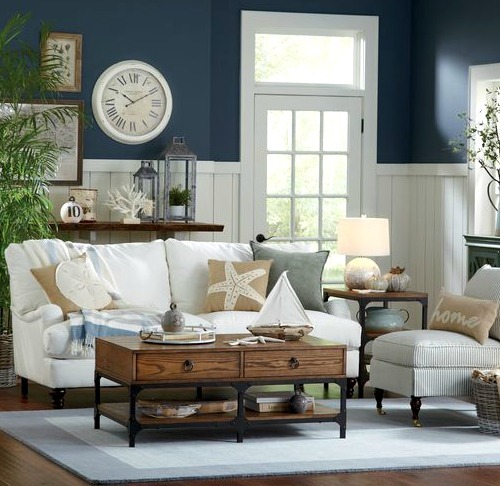 Other decorations include a Navy Blue Anchor Pillow Cover, Rope Table Lamp, and Large Round Wicker Baskets. Simple dining room idea with nautical flair. 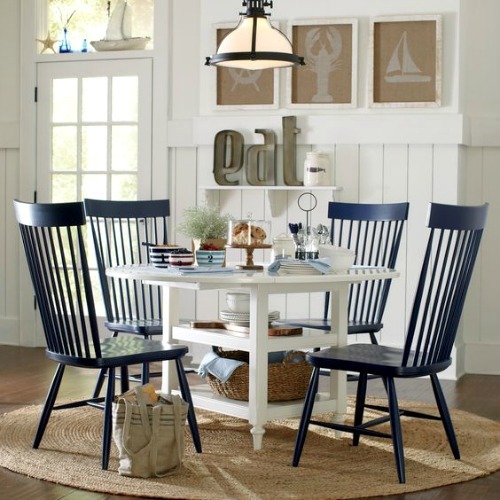 Birch Lane's White Drop-Leaf Table and Navy Blue Chairs. And the Sea Side Wall Art on Burlap complements the beautiful Round Jute Rug. Coastal dining room idea with cabinet. 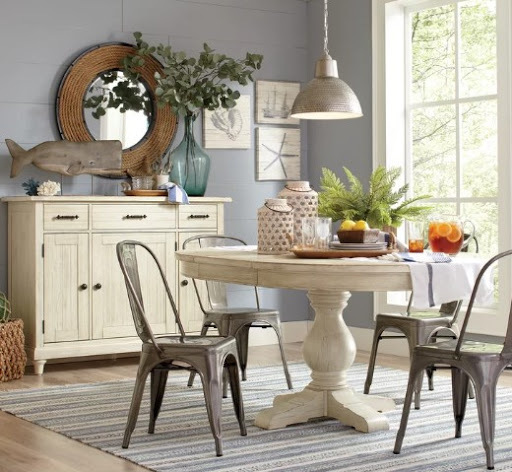 The coastal focal point in this Coastal Dining Room is the the buffet with a nautical theme vignette that includes the Rope Mirror and Wooden Whale.